The Depths is one of the new Epic Dungeons. Its pretty tough and can be a real killer if you are not careful. Basically you move from room to room fighting different types of spiders that hit hard, cast different status effects (none of them good). Take your time on the way to the boss room, these small spiders can and will ruin your day. Just getting through all the spider rooms to the boss room can be a chore. Once you get to the boss room you have to shoot through a white spider web barrier. If you try to rush on any class that is not a rogue, because it will almost be impossible to clear the final room before the boss without having to nexus. Once you get through the web barrier, you have entered the boss room. There are 4 large egg sacs scattered around the outside of the room that you need to kill to reduce the damage done by the boss Son of Arachna. If you do not kill these egg sacks you are in a world of hurt. BUT!!! !, the boss will not activate if you stay close to the walls and remove the large egg sacs as well as the smaller egg sacs. A melee with his short ranged weapon can hit the large egg sacs but he should move no closer than his extreme range. It is not possible to approach the destroyed large egg sacs to retrieve a drop without activating the boss. I recommend that you kill all the little egg sacs and the tiny spiders before you activate the boss. These spiders produce enough bad status effects to make fighting the boss hard. Once you are ready to start the boss, with a bit of luck keep the boss in one small area by having people surround it. 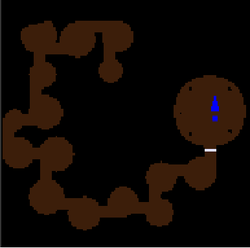 The boss tends to move away from people if it is surrounded it will keep moving but in a very small area. If there are just 2 people attacking then have the boss between them and it will move side to side but if you anticipate the bosses movements you can keep it in a small area. This makes it easier to kill. Note: During your time killing the large egg sacs if you see a Blue or White Bag appear, make your appologies and go get it. Most people will understand, and for those that don't, too friggen bad. If you can't survive the boss being activated with all the dangers that go with it, then you should not be here. This can be a very troubling dungeon for those unpotted. If you are in a small group take your time and clear. When hurt just move back to a safe area. I have successfully completed this a few times (unpotted) using a Huntress with a small group and got a mana drop once. Almost no chance to do it solo. Potted with Max DEF will help you here but you will have better luck as a 4/8 or better. Getting to the boss is an exercise in dodging as many of these spiders will chase you down. They have pretty good defense and hit really hard. The status effects are very dangerous. Rogues - Cloaking your way to the boss is not easy because if you wake the blue spiders they cast quiet and once you are uncloaked you are in trouble. I have found that the best way cloak and rush to the boss room is not to shoot at all. When you get to the web barrier you have to cloak and shoot it to break a path through. This is dangerous, when you uncloak I will move back into the room with all the spiders and spider sacs try not to wake any blue spiders and recloak as fast as possible. Get back to the barrier and punch your way through. Once on the other side call the group. If some smuck teleports to you before you break through the barrier your safest move may be to cloak and get out of the room letting that smuck deal with his mess. You may actually have to teleport back to the group in this case. Piercing classes - these types of weapons are a big help clearing out the spiders. Keep your distance and destroy them. Huntress - spam your T0 ability to slow the spiders which will give the group opportunity to kill them easier. Huntress with CTrap - throw the trap to paralyze the boss, count to 3 and throw the trap again. Use your MP pots to keep the trap going. Archer - use your ability to paralyze the boss, count 4 and paralyze him again. Keep him paralyzed by using your MP pots. Knight - Throwing out stuns can help a bit as you move through the rooms but you will find that mostly you will be quieted. Just hammer away. Chain stun the boss if possible. Mystic - Once at the web barrier switch to your longest timed Orb and keep the boss cursed. Sorcerer with Fulmination - Use your slow to help out the group and keep the spiders moving slowly. Keeping the boss slowed will allow the group to get more hits on him.